Pre-heat the oven to 375°F. Arrange the bacon on a broiler pan or parchment-lined baking sheet and bake until crisp, 15-18 minutes. In a medium size bowl, mix the sour cream, herbs, horseradish and garlic. Add the lemon juice and season with salt and pepper. Mix in the Tabasco sauce, to taste. Heat an outdoor grill or cast iron skillet over medium-high. Season the steak with the Worcestershire, salt and pepper; drizzle with EVOO. Cook to desired doneness, about 6 minutes per side for medium-rare. Let rest for 10 minutes, then thinly slice against the grain. Divide the baguette bottoms among plates. Top with some sliced steak, bacon, watercress, tomato and onion. Finish the subs with the baguette tops slathered with the horseradish sauce. In Recipes-list.com we have selected the most viewed recipes from category - uncategorized . Enjoy the best recipes specially selected for you! 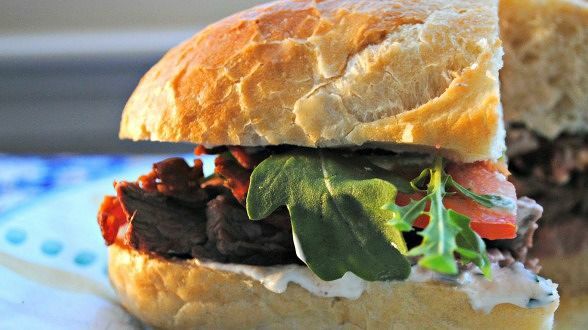 Sliced Steak Club Sub with Horseradish and Herb Sauce is the right choice that will satisfy all your claims.